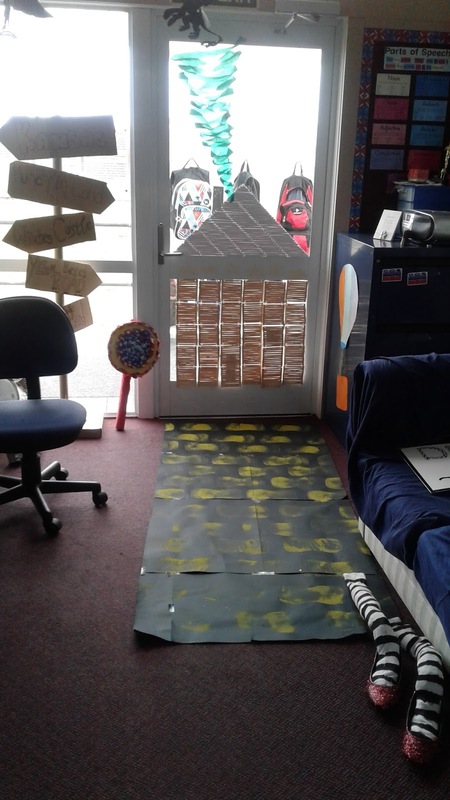 Totara 1 @ Grey Main School 2019: BOOK WEEK !!! A few weeks ago we had Book Week.We had to get our Door Display ready for the competition that we have between the syndicates. Ours was based on the book "Wizard of Oz".We were lucky enough to win against the other classes in team B!. Here are some photos of our finished door display. On the outside the witches legs stick out through the door with a Sign saying "Ding Dong the witch is dead". We made the house out of Popsicle sticks connected together by string. On the inside we had the yellow brick road with a sign saying all the different places. By the door there were the lollipops made out of plaited material, crape paper and cardboard. On the cabinet we stuck a hot air balloon made out of string and colored paper. Hanging from the light we made flying monkeys out of black paper and string. On Friday was Book Character day. We all dressed up in our favourite characters to share at assembly. All the teachers came into the hall dressed up as characters from Harry Potter. They even preformed a little skit for us! Here is a photo of the class in their costumes. Kia Ora T2. I'm Nicky from Mamaku. I really like the creative costumes for Book Character day. All of them hit a high standard all of the costumes are amazing mahi pai (Good job) T2. How long did it take for the door display? The star wars characters remind me of watching The Force Awakins but I just don't remember green lightsabers. Bula Totara 2 its Callum. I like your door display did you see ours in Mamaku (BFG, Charlie and the chocolate factory) I also like all your costumes there really cool. 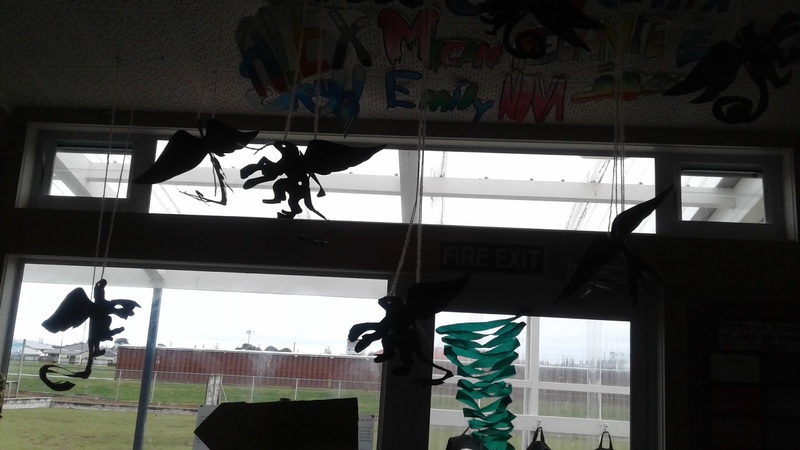 Kia orana Totara 2 my name is Kieren i like what you made with the two sticks to make Dorothys legs. We also have done the wizard of oz but that was 2 years ago. We did the exact same thing for Dorothy legs! You're class has some really cool costumes designs. Hello there,My name is Lily from room 8 at Waikohwai primary.I really like the way that you made your class look like the wizard of oz.It made me think of the time we did the school production about the wizard of oz.Maybe next time you could give a bigger description about the book week.If you would like to see my learning, my blog is http://wpslilyw.blogspot.co.nz/.Blog you later! Hi there, my name is Amie and I am a student in room 8 at Waikowhai School. I really like how everyone dressed up. It made me think of when our school had a production about wizard of oz . Have you thought about showing what your class won? If you would like to see my learning, my blog is http://wpsamiem. Blogspot.co.nz. Thanks for sharing this with me Totara 2 grey main school! Blog you later! Hi Totara 2 my name is Joyce from Waikowhai Primary School. Hi there Totara 2 it's Ashana here from Waikowhai Primary School I like your picture's of you in your costumes for book day. It reminder me of when we had book day at our school. Maybe next time you could show some Art work about your favourite character from any book. Thanks for sharing. 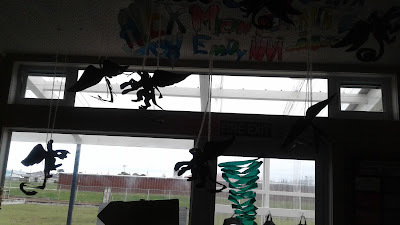 Kia ora,My name is Jerry R and I am a student in room 8 from waikowhai primary school. I love your costumes for book week. When I saw this post it reminded me of when I dressed up as a policeman in my old school. Did your whole school dress up in their own costumes? Kia Ora totara 2 I love your door display on wizard oz it's awesome I also love your costumes my favorite pic was star wars.